My mother got the phone call early in the morning. Uncle John had passed away in Armagh, Northern Ireland. Uncle John was my father’s younger and only brother. My father, Pat, had not seen John since he left Ireland on a boat to America in 1929. Mother called Pat while he was at work in Manhattan at 1441 Broadway and told him that his brother had died. He left work and took the subway home to the Bronx. In an Irish American household it is a tradition that someone travel to Ireland to represent the family from America in the event of a death. The question was, who would go? It was winter. The week between Christmas and New Year’s when most companies are closed or have reduced work hours. Or, in my case people are on vacation. I had just started a new job but negotiated some time off. I would soon learn that the most important thing was that I was the only one of the family with a passport. My father had never left New York since arriving and did not have a passport. Heck, he didn’t even have a driver’s license. When he came home on the subway that day plans were already underway. I would represent the family. I was the only one with a passport who could go. My oldest brother, Patrick, was away on a ski trip in upstate New York and we could not reach him. It was a different age. There were no cell phones. Everyone had answering machines. I left several voice messages for Pat to please call back and let us know if he could get to an airport and get to Ireland in time for the funeral. He would tell me when I returned from Ireland, how he listened to the messages on his answering machine one after the other and could not believe the sequence of events that transpired within a few hours while he was skiing. My father returned home to the Bronx that afternoon and said to my mother, “I’m going. I have to go. Noreen cannot go alone. I need to be there with her. What do I need?” My mother explained to him that it was not like taking the subway or the bus. He could not get on a plane without the necessary papers. Importantly, he needed a passport. “Fine. Give me the papers I need and Mary (his daughter) will drive me to the city to get a passport.” No one thought this would be possible. But we did not want to disappoint my father and felt the urgency to at least try. I was already on the way to the airport with a vague notion that perhaps my father would be on the flight, but most likely not. Who could get a passport in a few minutes, during a holiday week in New York City? Meanwhile, Mary drove my father down to Manhattan to a place near St. Patrick’s Cathedral that my father knew handled passports. The office was closing and my father could not get in the front door. What you don’t know is that my father was employed as a starter. He was an elevator operator for one of those buildings in New York that had hand powered freight elevators. 1441 Broadway was a fashion building. Perry Ellis, Jack MulQueen and others were showcased there and all knew my father as a man of integrity and hard work. He was a long time member of the SEIU Local 32BJ, a union of service employees. He knew just about everyone there is to know in building services in New York City. Critically important was he knew the guy who would let him in the back door to the passport office. My father pleaded his case to the passport office manager. His younger brother had died in Ireland. He hadn’t been back to Ireland since 1929. He needed a passport today to make a plane departing in a few hours. Could he help? Sure. My father gave him $20. Given the times, it was a lot of money for my father—and for the manager. It worked. My father strolled into the lobby of Aer Lingus wearing his fedora, cashmere coat and a Chesterfield cigarette in his mouth. I grinned and held back tears. All the years I wanted to take my father “home to Ireland” but he would not go. He often would joke that he hadn’t forgot anything. Why go back? The real reason was far more serious. My father’s plan was to save enough money to go home to see his father. His father died before he could save enough money and he could not afford to go home for his father’s funeral. Perhaps he regretted that so he wanted to go home this time to pay his respects to his brother, his brother's wife, Aunt Margaret, and the family and people he left when he set sail for America. The plane ride was incredible. A flood of feelings and memories cascaded over me. All the different Irish cousins, neighbors and visitors to our home in the Bronx on Sundays would most likely be at this wake and funeral. I felt as if in a dream. This was a trip to say goodbye to one great man, but also to rekindle the bonds of friendship and family that were still alive and growing. My father was not in the best of health, so I was given instructions on making sure he took his medicine. Other than that, I decided to bring along a video camera to see what I could capture. For those who were unable to come, this was an historic trip. The clan in Ireland and America would all want to know what went on. This video would be a record of the trip. 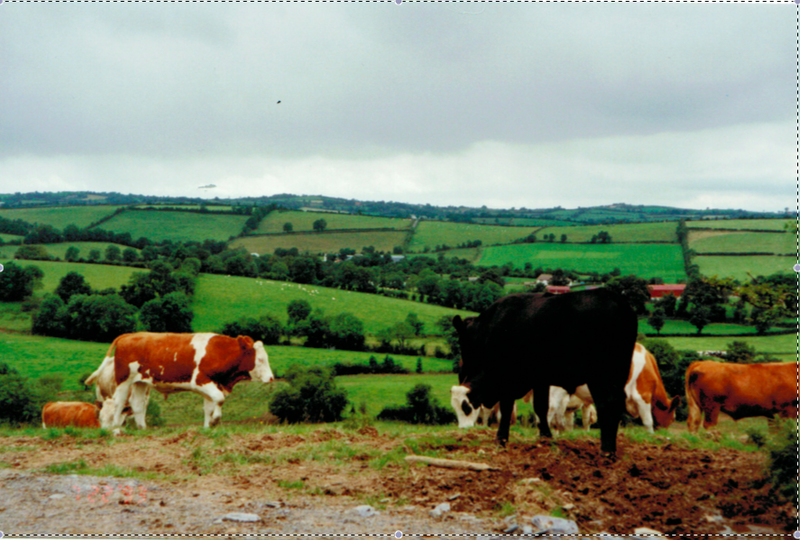 We landed in Dublin and one of Uncle John’s children picked us up and drove us to my father’s “home place” in Keady, County Armagh in Northern Ireland. Everything was so green. The air was filled with the smell of turf fires. The roads were narrow, few cars, and there was farmland everywhere. Since we were in the North of Ireland, the British army was evident. Perhaps there was not much change in his hometown, but my father’s memory was sharp. He recalled every nook and cranny of a town he left over fifty years before. This was a man who ran, walked and worked on these roads for twenty six years as there was no other transportation for a poor farm boy living in the country. We got to the home place and it was filled with family and neighbors paying their respects. Uncle John’s body was upstairs in his bedroom laid out with a window open. This was my first wake in a home. It was surreal. I think having my father come to this wake and later funeral meant a lot to my Aunt Margaret and to Uncle John’s ten children and the cousins. It was the first time I was meeting many of them. I had never been in a house with so many people I did not know, yet strangely we all sort of looked alike! The Rafferty clan was indeed large and the gene pool was very evident in this room. Image from Uncle John's wake. Pat Rafferty with Kate and Susie, his two sisters. We had come to say our condolences to my Aunt Margaret and her children and their families as well as the many extended relatives that had traveled from as far away as Van Diemen’s Land, Australia. True to form this was a traditional Irish wake. It was pretty complete with the men smoking and sipping whiskey or Guinness and the women serving tea and biscuits and fussing over the men and the younger children drinking tea in their baby bottles. An elderly gentleman came up to me with barely any teeth in his mouth, hands that showed hard manual labor and yet a twinkle in his eye and said that he knew my dad when he was a wee fellow. Time was not on his side. The poor man looked much older than my father and it was hard to believe he was younger. It was great to hear his stories about my father who I was beginning to understand was a bit of a legend in Armagh. The funeral was the next morning and as tradition would have it, the casket was carried out of the home and down the lane to the local parish church. The family, friends and what seemed like several hundred people followed the casket into the church for a full Mass. Afterwards, there was a meal prepared and served in a community house across from the church. As an American, I felt out of sorts in this setting. I wanted to help as it looked as though there were mostly men and elderly women sitting down and being served a meal of tea, biscuits, beef and potatoes. The women were rushing around tending to the men and the children were helping too. I decided to get up and go to the kitchen to see if I could help. The woman in charge insisted that I sit down and it was no bother but I felt I should help. One woman asked me to fetch the milk for the tea. I searched in vain for what I thought was ages to find a milk carton. Finally, she pointed under the table. There, in a metal bucket was a yellowish milky substance. It was the local farmer, Mr. Greene’s milk, straight from the cow that morning. Fresh as can be. Definitely not pasteurized. Bon appétit! This trip to Ireland served as a catharsis for me. On the plane ride home they played the movie, “Da.” I could not believe it. 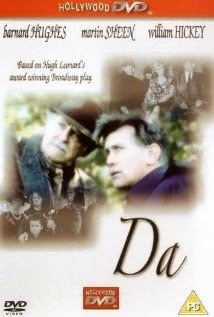 This Tony Award-winning Broadway play and later movie starring Martin Sheen and Barnard Hughes was incredibly timely. The basis of the movie is an Irish playwright flies home to Ireland to bury his father. Well it was close enough to my very own trip, except we were burying my father's brother, my uncle. The Irish refer to their father as Da, short for the American version, dad. My father who was hard of hearing did not watch the movie. From time to time he would look over at me watching the movie and see tears in my eyes. He’d ask what was the matter and I was so caught up in the emotion of the movie I could not speak. I kept thinking about how my cousins must have felt losing their da and knowing my own father only had so much time. He seemed so strong, so alive in Ireland. I felt privileged to be a part of this coming home event. Little did I know he too would leave this earth a year later. We only have so many days on this planet. It is so important to make the most of them and to celebrate the good times, remember the bad, learn from them and make memories when you can. 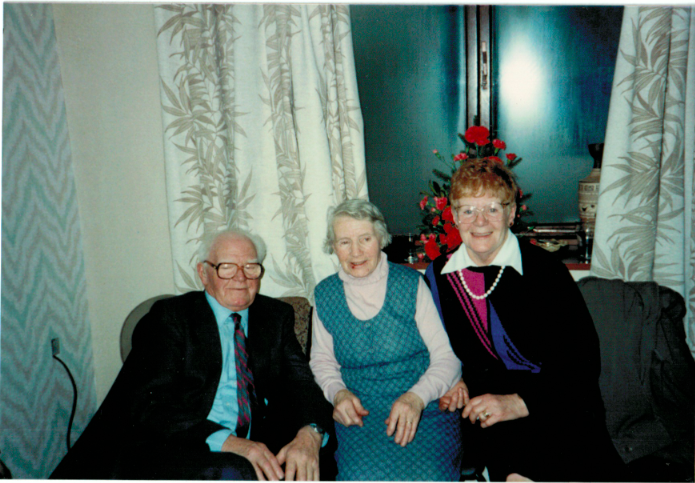 Thanks so much for sharing this beautiful personal story about your journey back to Ireland for your uncle's funeral. I love how your father talked his way into a truly "expedited" passport service - an Irishman with the gift of the gab. What a blessing to be able to share this experience with him. So sorry to hear you did not have much longer to enjoy with him on this earth. I'm sure he has read and thoroughly enjoyed this blog post in heaven. Very well done Noreen. Your work is spot on for a lot of first generation Americans. Thank you DMSOL. Glad you like it. Great read. Lovely story. Sometimes I forget how lucky I am to be a modern day immigrant. I am generally able to get back to Ireland once a year and then there is is Facebook and relatively cheap phone calls. If fact my mother in Ireland is often frustrated by the fact that I am more in contact with her grandchildren who live there than she is.